Hello, fashionistas! I know many brands are embracing the neutral hues, pastels, and rolling out beautiful white pieces for spring and summer, but this gal is embracing the piercing bright colors. 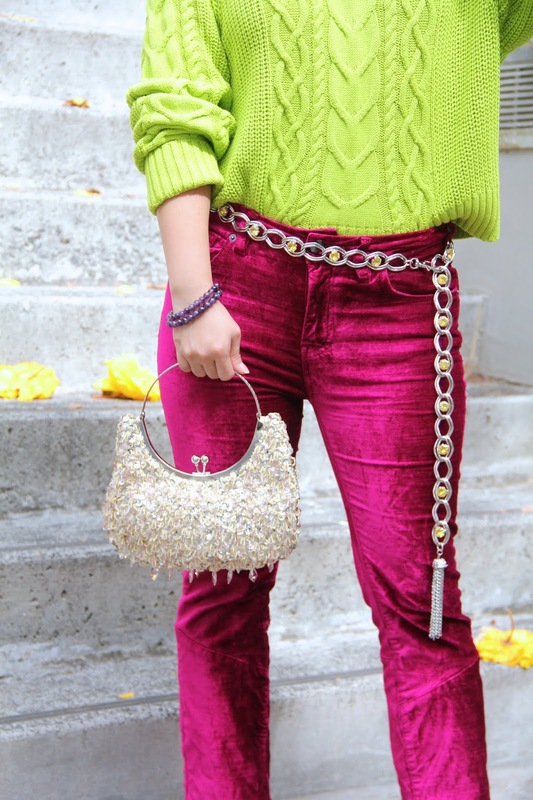 I saw these striking magenta velvet pants at T.J. Maxx and I instantly became inspired to put together this fun colorful outfit complete with emerald, lemon, and purple accessories. I just kinda went for it and I love the way it turned out! As I've mentioned before on my blog, I love pairing hot pink with lime green. It's a color combo that always puts a smile on my face. Not to be cliche, but I decided to pair these bright raspberry pants with a neon green sweater. Everyone could definitely see me loud and clear from miles away! Besides the neon green and magenta, I added a yellow accented chain belt and amethyst bracelets into the mix. This look is like a big melting pot of colors, but with a dash of sparkle! To complement my silver accessories, I wore an equally show-stopping vintage-inspired beaded bag. And no outfit of mine would be complete without a pair of heels. For this ootd, I went for a pair of elegant velvet Manolo Blahnik heels. I've been keeping this pair hostage in the box since I purchased them to keep them pristine, but I finally decided to take them out for a spin! Last but not least, I popped on a pair of statement earrings and slipped on a pair of silver shades. I also carried one of my favorite motivational books, The Subtle Art of Not Giving a F*ck, because reading is chic. Personally, I love it because it's not your typical self-help book and I really love the author's voice and anecdotes. And who knew it would match the butterfly background so perfectly? Well, I hope you enjoyed reading this post! If not, I hope you walk away with a new book to add to your list of books to read. Trust me, The Subtle Art of Not Giving a F*ck is a great one that you're not gonna wanna miss. As always, I am sending you lots of love from my heart to yours! Questionable name of that book aside... this is a most interesting outfit, especially because of the color combination. I wouldn't know of any fashionista pairing a neon sweater with velvet pants and also some velvet pumps. You somehow bring it all together with truly chic looks. So great job styling here! Thank you so much, John! I took a risk in pairing neon green, magenta, emerald green, and purple together. I'm happy that you like it!